“Between 1914 and 1918, a global conflict changed the course of history. 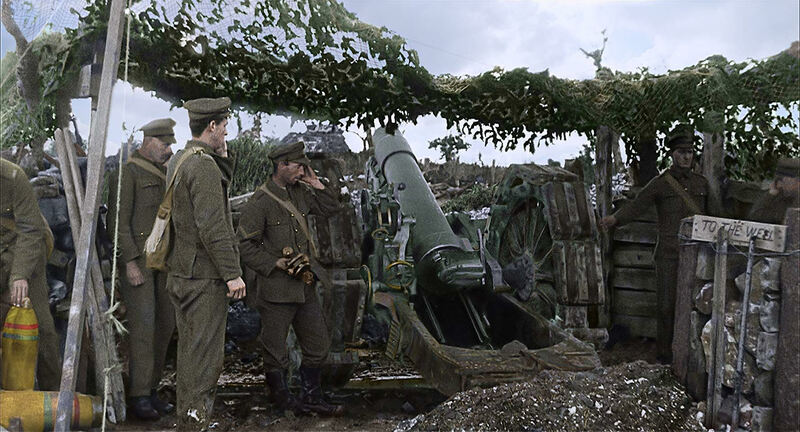 The people who experienced it did not live in a silent, black and white world.” Commissioned by 14-18 NOW and The Imperial War Museum in association with the BBC, “They Shall Not Grow Old” (2018) is directed by Academy Award-winning director Peter Jackson and is the first World War I documentary to feature colorized, original First World War-footage throughout most of the film. “They Shall Not Grow Old” (2018) was originally released in a limited amount of theaters in December 2018, with all showings instantly selling out. Distributor and production companies Warner Bros. Pictures and WingNut Films (created by Peter Jackson) then decided to reopen the film from the end of January to the beginning of February, allowing it to become available for World War I historians and aficionados on the silver screen once more. The release date of 2018 was chosen by 14-18 NOW and The Imperial War Museum to mark the 100 year anniversary of the Armistice of November 11, 1918, the official end of the First World War. 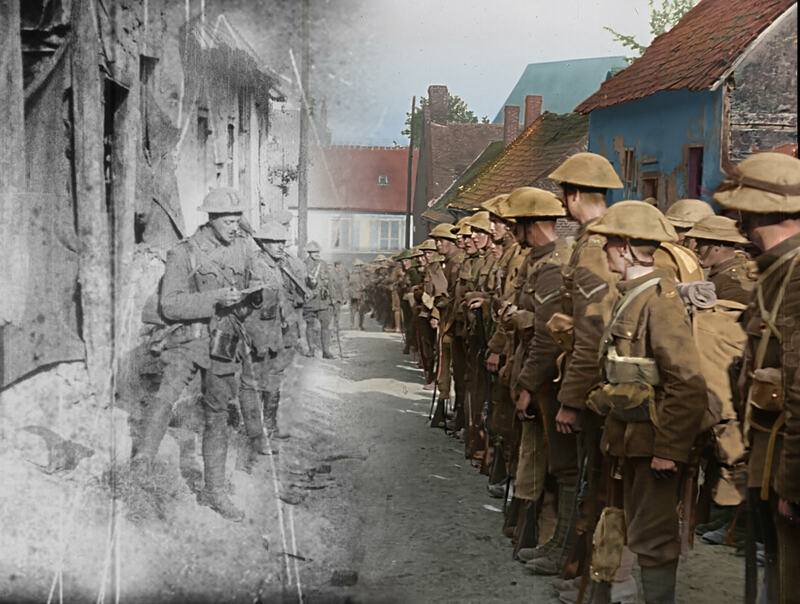 “They Shall Not Grow Old” (2018) is the first film Peter Jackson has directed since “The Hobbit: The Battle of the Five Armies” (2014). He has worked nonstop on this new film since 2014 and every day, hour, minute, and second he dedicated towards it shows heavily in the final product, a flawless masterpiece and marvel of documentary filmmaking that proves Jackson is one of the best filmmakers of the modern age. The film manages to be authentic, heartbreaking, and educational all at once. 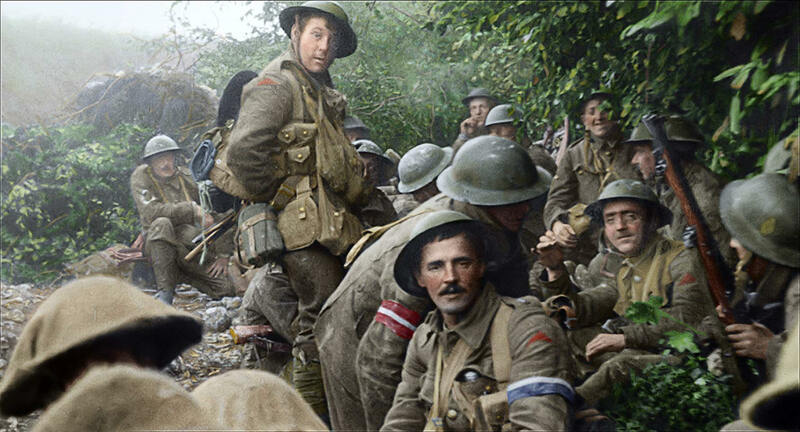 You learn about soldiers’ experiences, presented through memoirs and footage from the moment the soldiers chose to join the fight through the Battle Of The Somme (1916) and to the war’s aftermath, when only a tiny percentage of men came home. The added sound effects and voice-overs, comprised solely from audio recordings of actual World War I veterans, make this documentary feel miraculously genuine. 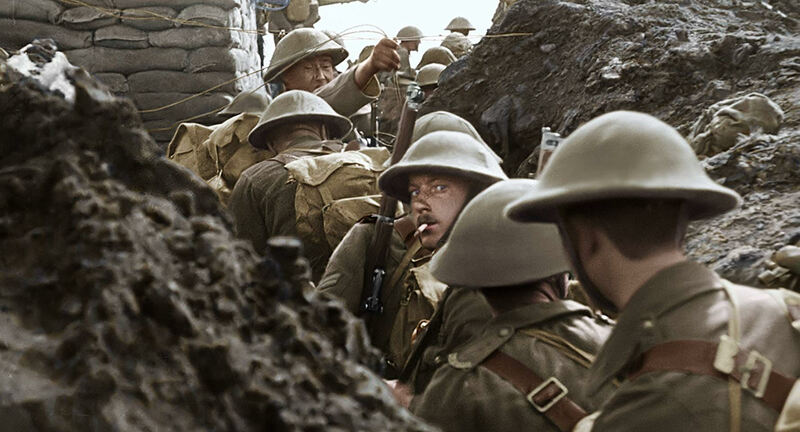 Unlike most other war films and documentaries, Peter Jackson decided to look fairly and empathically into the emotional state of both the British and German soldiers and how they did not hate one another. Prisoners would actually sometimes become friends with soldiers from the other side. The men were combatants of a conflict they did not care about nor understand. 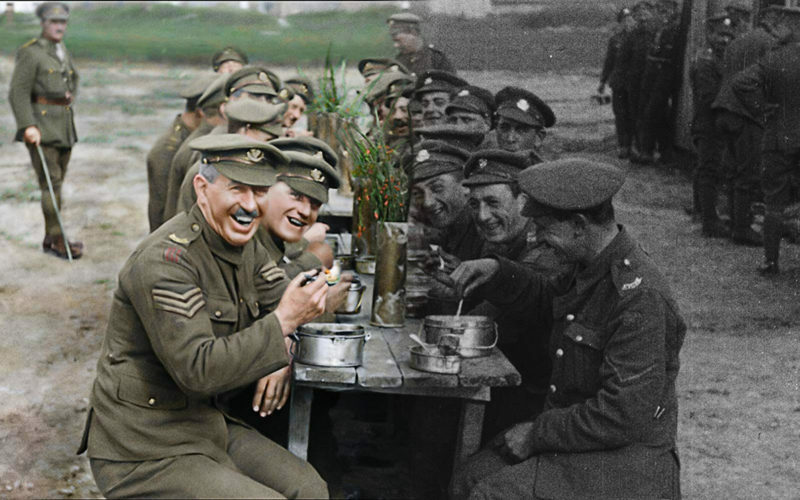 Since the debut of the first trailer in November 2018, the most obvious point of media focus and attention for “They Shall Not Grow Old” (2018), aside from it being directed by Peter Jackson, has been the technologically groundbreaking aspect of his team colorizing and bringing 100-year-old footage to life. Jackson and his team adjusted frame rates to modern standard speeds, making the film feel more current. Century-old footage feels new. I have a hard time finding any problems with “They Shall Not Grow Old” (2018). If I have to imagine something, it is only that I wish it had been longer, even though the running time is 2 hr. 12 minutes. The film was that captivating and instructive. The use of aerial warfare and submarines and the rise of women working in factories (while the men were off killing) were all aspects of the war and ones that could have been discussed in the documentary. However, Jackson, a World War I aficionado, expressed that while he is aware of all those other elements which could have been shown, he wanted to make a film solely about lives on the ground of the Western Front, specifically the nature of trench warfare. Since its release, “They Shall Not Grow Old” (2018) has gotten absolutely no negative reviews. IMDb rated the film 8.5/10; Metacritic, 92%; and the documentary currently stands at 98% on Rotten Tomatoes. As the documentary is not in many theaters, the box office can’t be compared to films with larger releases, so the relatively modest ticket sales it’s brought in, roughly $11 million (as of February 3, 2019), is respectable. 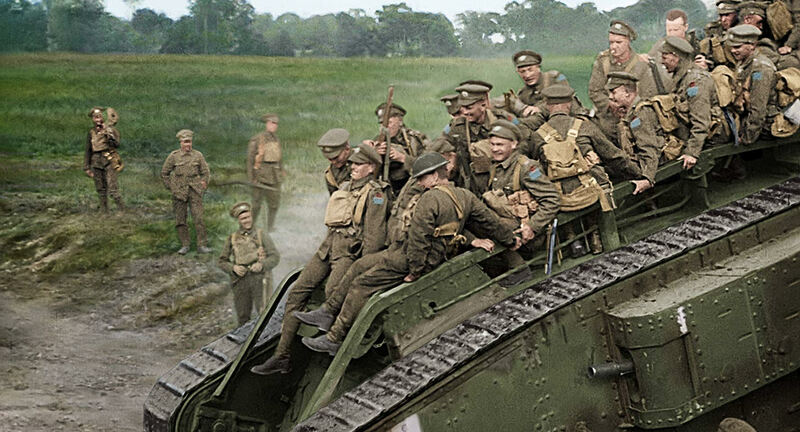 Having seen the movie in theaters twice (as of February 2), I can unequivocally say that “They Shall Not Grow Old” (2018), regardless of any possible flaws, is a need-to-see documentary, one best seen in theaters. Anyone lucky enough to see it on the big screen will also have the added bonus of seeing a (digital) interview after the film with the director, where we learn why Peter Jackson made the decisions he did. It rarely occurs that you see a movie as utterly breathtaking and magnificent as “They Shall Not Grow Old” (2018). Balancing a history lesson and an entertaining film is no easy task, but Peter Jackson, with his passion towards the topic of the First World War, stoked by his grandfather having fought in the war, has (successfully) risen to the challenge. The film requires viewers who can handle the gore and horrors of war. This film is not for those averse to the (accurate) depiction of violence. “They Shall Not Grow Old” (2018) is one of my favorite films of 2018, and I give it a 99%, in part due to my own interest in World War I, but also due to the incredible craftsmanship and compelling story the film embodies.